The rising cost of housing has led to an increase in the number of evictions nationwide, and Wisconsin is no exception. For the two most recent years where numbers are available, there were 28,501 eviction cases filed in 2012 and 28,812 in 2013. Most tenants face these legal proceedings without counsel. But an eviction is not only extremely unsettling for tenants; it has significant short and long-term socio-economic impacts. Access to legal services can help reduce those costs. 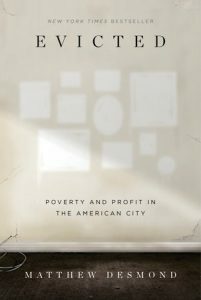 Desmond probes the spiral of eviction-induced instability in his new book – Evicted: Poverty and Profit in the American City. Among other things, Desmond found that evictions are often a driver, not a side-effect of economic instability. This unexpected conclusion has significant policy implications. In her article for The Atlantic, Gillian B. White concisely summarizes the downward spiral after an eviction: “The psychological, legal, and financial damage inflicted by the process makes it difficult to find new housing, or to keep a job, or provide a stable education for children.” Landlords are reluctant to rent to tenants who have been evicted in the past. Employers often look at the credit history of applicants and screen out those with low scores, including those caused by an eviction judgement. Families then have to settle for the least desirable housing in the least desirable areas, with fewer economic opportunities for themselves and lower performing schools for their children.